Okay, that’s not true. That’s a lie. Muskoxen never ruled the earth. I just said that to catch your eye. But – Muskoxen did live here. Not just up in the high arctic, but here, where we are – in the continental United States, in California, New Jersey, Texas, Missouri, Oklahoma. They were everywhere. So, let’s spend a moment talking about muskoxen, scientific name: Ovibos moschatus. 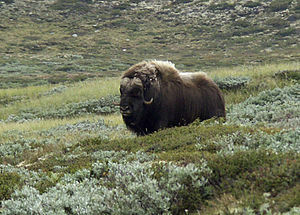 Sometimes called the tundra muskoxen. And, yes, the plural of muskox is muskoxen. And apparently, one can spell the name of the great beast as either muskox (one word), or musk ox (two words). Ditto muskoxen (or musk oxen, if you will). 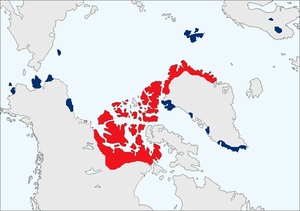 There are still muskoxen today, mostly living up in the Canadian arctic and Greenland, although a few introduced populations exist elsewhere in the polar north, including Sweden and Alaska. And, despite their appearance, they are not oxen. They are more closely related to sheep and goats. They’re big, standing 4 to 5 feet at the shoulders, weighing 500 to 900 pounds. Both the males and females are armed with those sharp, curved and deadly horns. Both sexes are covered with thick shaggy pelts, with guard hairs that almost reach the ground. They’re the ones who form a protective ring around their young when threatened by predation from wolves. The name comes from the strong musky scent of the males. Big, shaggy, razor-sharp horns, and they smell: What’s not to love? To my eye, they look primitive, atavistic, survivors from a by-gone era. And that’s just what they. 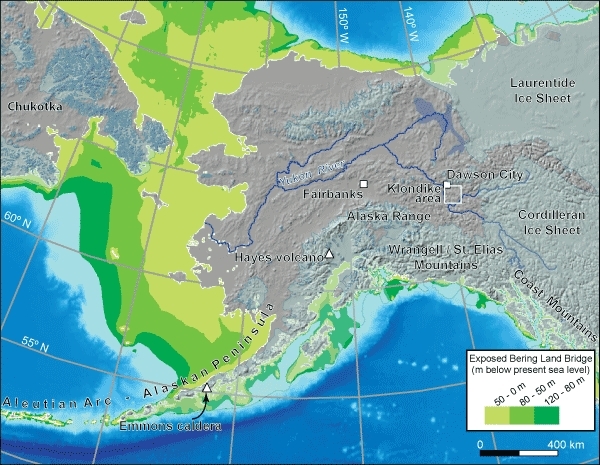 They’re believed to have come into North America one hundred to two hundred thousand years ago, across Beringia, the land bridge that connected Siberia to North America, when the ocean levels were hundreds of meters lower, due to the Ice Age. And then, during the extinction event of eleven thousand or so years ago, their range shrank dramatically: While they had previously been widespread in the circumpolar north, they disappeared, save for those living in northern North America. 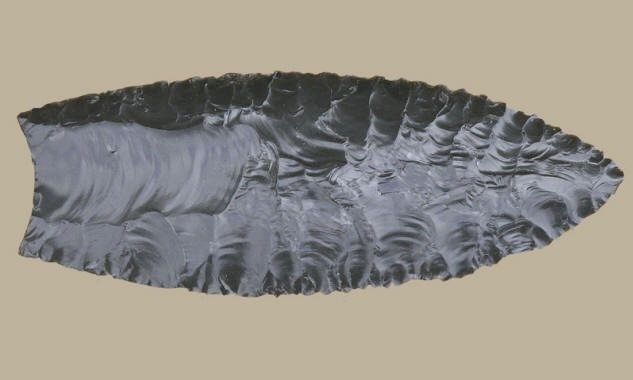 From there, they gradually spread north and east, arriving in Greenland around 350 A.D. They were contemporaries of the mammoth, the mastodon, all of the other (now-extinct) megafauana. But unlike so many other species, the muskox survived, and did not go extinct. Today there are fewer of them, and less genetic diversity than before. They may be on the long slow road to extinction. Maybe not. Check back with me in fifteen or twenty thousand years. They’re not the muskoxen I want to talk about today. Today, I want to talk about a closely related species of muskox, a species now extinct: The helmeted muskox, Bootherium bombifrons. This one – the helmeted muskox – was the one that was here; the one that lived in New Jersey, and Texas, and California until about 10 or 11 thousand years ago. This one is ours. This muskox appears to have evolved and lived only here, in North America. Its closest relative is the tundra muskox living far to the north today, but the helmeted muskox was significantly different. For one thing, it was bigger; taller, anyway. It stood five to six feet at the shoulders. But it was leaner than Ovibos. Its skull was thicker, and its snout was much longer. And its horns –those curved, pointed, killing weapons -were fused on the top of its head, forming a great bony plate. Ideal for head-butting your rivals when it’s mating season. This anatomy differs from that of the tundra muskox, whose horns are separated from each other by a groove, although the tundra muskox engages in serious head-butting during the rut, too. Like the tundra muskox, the helmeted muskox had a coat of dark brown hair, but its was shorter and finer than that of Ovibos. As mentioned above, its remains have been found all over – but not a lot of them, not many fossils. So, although they were widely distributed, there apparently weren’t vast numbers of them. And, as is so often the case with extinct animals, much about them is not known. There is, for instance, some question about its preferred habitat. It seems likely, however, that it preferred open wooded areas, or savannah-like habitats, where it could eat a varied diet of grasses, woody plants, and shrubs. So, a generalist, not dependent on a single food source. It was here, throughout the United States, moving through open woods, probably in small herds, rutting, mating, raising its young, forming a defensive ring to stand off wolves or other predators; grazing or browsing on shrubs. And yet, it is extinct, while its close cousin, the tundra muskox, survives. Why? There aren’t a lot of fossil remains, but it doesn’t seem likely that hunting was the primary reason for its extinction (although it certainly may have been a contributing factor). Climate change? Probably. But the details are unclear. Lots of large animals went extinct roughly ten, eleven thousand years ago, but not all of them: Not the moose, not the bison, not the pronghorn, and not the tundra muskox. So why did the helmeted muskox disappear? It was widespread, had a varied diet – what happened to wipe it out? One theory, and it is only a theory, is that it got squeezed between the tundra muskox – better adapted for life in the far north; and the bison – better for life in open woods. But I don’t know. And one last thing: The helmeted muskox was NOT the only muskox species to live here. There was another, a giant: The Shrub-ox, Euceratherium collinum. It was huge, much bigger than the muskox or helmeted muskox. But that is a report for another day.